As someone who had never taken a d.school class, when I heard the words “design thinking” they seemed to conjure a single image of rainbow Post-its. On the Post-its floated buzzwords that meant little in my mind: disrupt, need-finding, ideate. Design thinking, I knew, was never the simple culmination of a thousand sticky neon squares, posted and reposted on walls and whiteboards in the loft-style, high-ceiling-ed d.school. But then, what was it? “It’s not rocket science,” Karen Ladenheim ’14 MS ’15 informed me when I told her that I wished to pinpoint what, exactly, design thinking was. Ladenheim, a mechanical engineering co-term, had first learned about design thinking as a high school senior when she read d.school instructor Tina Seelig’s “What I Wish I Knew When I Was 20.” She then came to Stanford as an undergraduate and majored in product design. Ladenheim’s capstone project used design thinking to work with mobile “brain game” maker, Lumosity, to create Rhythm Revolution, a game that helps music-craving adults improve their ability to keep rhythm. Disrupt, need-finding, ideate. What did “design thinking” truly entail, and why had I heard it praised by students, educators and administrators alike? After more than four years at Stanford, I had decided to finally find out. The Hasso-Plattner Institute of Design, better known as the d.school, was founded in 2005. The d.school building’s interior walls were once the exterior walls of an older campus structure; furniture is never bolted down so classrooms can remain dynamic; and chairs are slightly uncomfortable so that students get up more and sit down less. “Design thinking,” I learned quickly, is difficult to pin down into a single definition. The d.school’s online fact sheet boasts design thinking as providing “a glue that brings teammates together around a common goal: make the lives of the people they’re designing for better.” Design thinking classes are focused on “creating innovators rather than any particular innovation,” and the art of design thinking is best learned by doing. Ladenheim described design thinking as “a tangible scaffolding through which [one] can approach problem solving.” She specified “reframing” the problem as a central tenant of the process, citing the redesigning of scissors as a paradigmatic example. In light of the first two actions, “empathize” and “define,” d.school executive director Sarah Stein Greenberg stressed design thinking as a process that highlights problem finding as much as it does problem solving. It is a human-centered design process: one that encourages designers to observe users in the authentic context of their lives and “empathize,” or experience the same problems that their users are experiencing. Before becoming executive director, Stein Greenberg, who completed her MBA at the Graduate School of Business just as the d.school was opening, spent several years in India working closely with locals on social impact projects. I questioned Stein Greenberg on Peter Miller’s assertion in his recent Chronicle of Higher Education article that design thinking could not (yet) become the new liberal arts because it appears to prioritize observing the current context over learning from historical research. She responded that the ideology of design thinking was never meant to replace that of the liberal arts—at Stanford, or anywhere else. Its position, rather, is complementary. Yet as she made that distinction, Stein Greenberg was quick to clarify that design thinking indisputably considers the historical context of any issue, just not at the beginning of the process. She cited the “curse of knowledge” as a reason for doing so. “Human beings are inherently creative, and design thinking offers a set of tools that really helps bring that out and helps people express their creativity,” she said. Empathize, define, ideate, prototype, test. I pondered the originality of these terms as tools for creativity. Jonathan Kleiman, the lead instructor of Designing Your Stanford, a course that applies design thinking principles to help freshmen and sophomores to plan a meaningful college experience, explained—or confirmed—that what makes design thinking so distinctive is not necessarily the values that the process espouses, such as having empathy or prototyping as early as possible, but the very fact that these values have been codified into simple, coherent actions and mindsets. Kleiman acknowledged that as one travels farther east, away from Silicon Valley, fewer people have heard of the term “design thinking,” much less understand what it means. His definition of the process is self-aware: Design thinking is an approach to problem solving that begins with [traditional] practices—putting the user first and finding out their needs—and then emphasizes rapidly prototyping, testing and gathering user feedback, based on ideas that were generated (“ideated”) from the initial need-finding process. 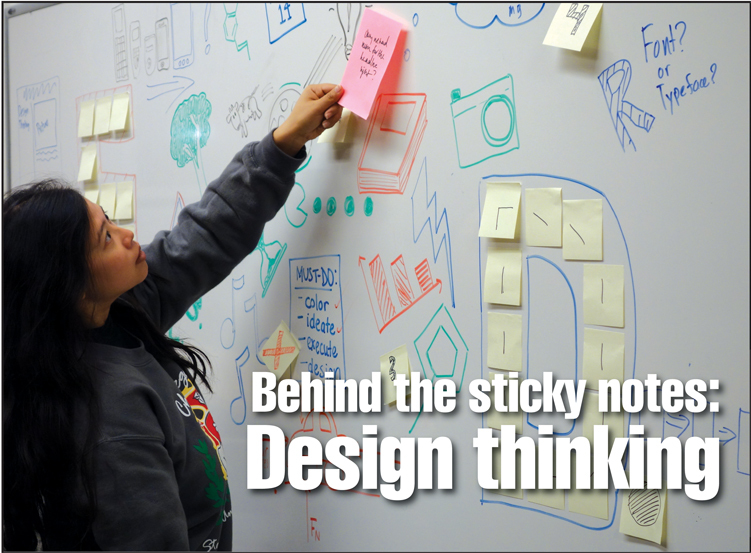 “[Design thinking is] learning by doing, learning by trying,” Kleiman said. Instead of spending years researching and attempting to “perfect the right product” before putting it out into the world, why not just “try something, make something and learn something”—in a matter of hours, days or weeks? Yet the veritably simple, and somewhat linear, nature of the “packaging” of design thinking—a structured codification that opens a gateway to unstructured thinking and creativity—is what makes design thinking so appealing. Its simplicity is what makes design thinking applicable to solving problems less tangible and less defined than improving incubators, toothbrushes and computer games. 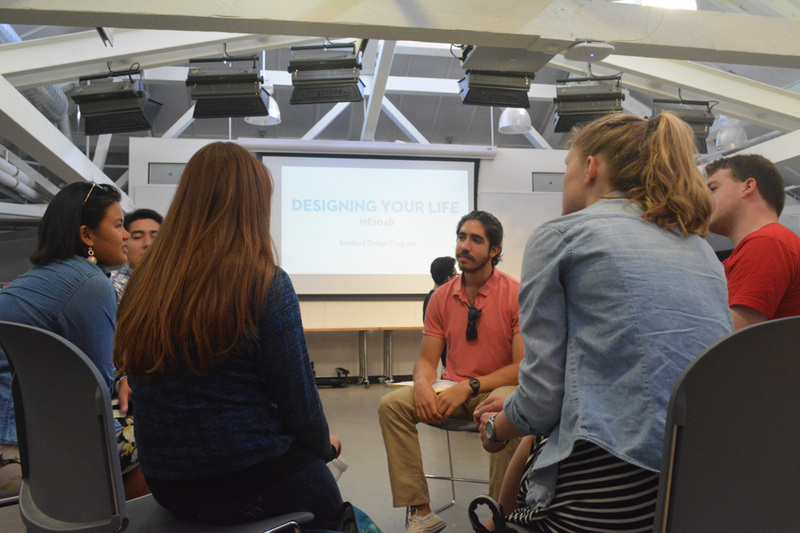 Enter Designing Your Life and Designing Your Stanford, two courses offered by the design division of the Mechanical Engineering Department, both of which are taught by members of the Life Design (“d.life”) Lab. The d.life team is focused on employing design thinking in scenarios where user and designer are one and the same: life itself. Designing Your Stanford (DYS) aims to help freshmen and sophomores design a personally meaningful Stanford experience; Designing Your Life (DYL) aids juniors and seniors in building a post-graduate pathway that prioritizes fulfillment and understanding over the belief that only “right” or “wrong” career-related decisions can be made. Both DYS and DYL emphasize the values of reflection and open-mindedness. At the beginning of the quarter, students make “way-finding” maps —diagrams of meaningful past experiences—to mine them for telling connections that might inform their future academic or career plans. Later in the quarter, students create “mind-tree” maps, which involves designing not one, but three, different pathways that they might follow in the future. The implication of designing three pathways, Kleiman said, is “immediately freeing to students because it takes off that pressure of having to ‘do it right.’” Instead, it acknowledges that there are multiple ways of going about Stanford, and after Stanford, that would make students happy. DYS students brainstorm pathways for the remainder of their years at Stanford, while DYL students create five-year-long “Odyssey plans” that commence after graduation. I walked into Designing Your Stanford on a windy Thursday afternoon, yet something about the atmosphere—and the energy—immediately transformed the day into a sunny, summer Friday. Music played in the background as the 44 students of DYS sat down around seven large tables, placed at various angles within Lathrop Library’s spacious Room 282. Each table was headed by a section facilitator, either a DYS instructor or a student graduate of the course. As I joined Kleiman’s table and became student #45, the arrangement reminded me of that of an elementary or middle school classroom; it was a far cry from the setup of a normal college lecture hall. The topic for that week was “Designing Your Way Forward”: using design thinking to tackle a goal, be it old or new, long-term or short-term, that we found challenging to approach. For practice, we would get up and split into groups of three (“triads”), and then employ adapted mindsets such as “Curiosity” (“What interesting questions can I ask about this?”) and “Radical Collaboration” (“Who can I work with that’s unlike me?”) to help one another “design our way forward.” We would jot down answers on individual rainbow Post-its, a representation of the wild and near-infinite possibilities of brainstorming. Scott Morris, ’18, one of the members of my triad, presented his problem first. There was a baseball game that he wanted to attend that night, but pressing physics and CS 103 problem sets stood in the way. For “Radical Collaboration,” Nick Hershey, ’18, the second member of my triad, suggested that Morris work in an RA’s room; the RA could, better than his friends, keep him from getting distracted. Morris considered the option. For “Curiosity,” I asked Morris whether he had attended a Giants game before. Yes, as a regular fan, he had—so no, tonight’s game would not be a once-in-a-lifetime experience. I then asked Morris whom the Giants were playing that night. He did not know. Hershey and I concluded that Morris was not a dedicated enough fan. Morris looked up the opposing team (the Marlins) on his phone, and concluded that the competition was too lacking for him to compromise two time-intensive problem sets. We had solved a small, small challenge in our four-minute brainstorming session. But then, aren’t most of life’s large, wicked problems composed of countless little problems? Contact Grace Chao at gracewc ‘at’ stanford.edu.